SMURFing is back for the summer 2017 ecological monitoring season, woohoo! Okay wait, what is a SMURF again? We’re not talking about the little, blue, hat-wearing cartoons. SMURF stands for the “Standard Monitoring Unit for the Recruitment of Fishes” and is a sampling tool we use to collect information on juvenile fish. We’re just beginning to understand which species use the nearshore habitats off the Oregon coast during their early life stages. Tracking how many juveniles are using these nearshore habitats is also helpful for understanding any changes we see in adult populations in the future. 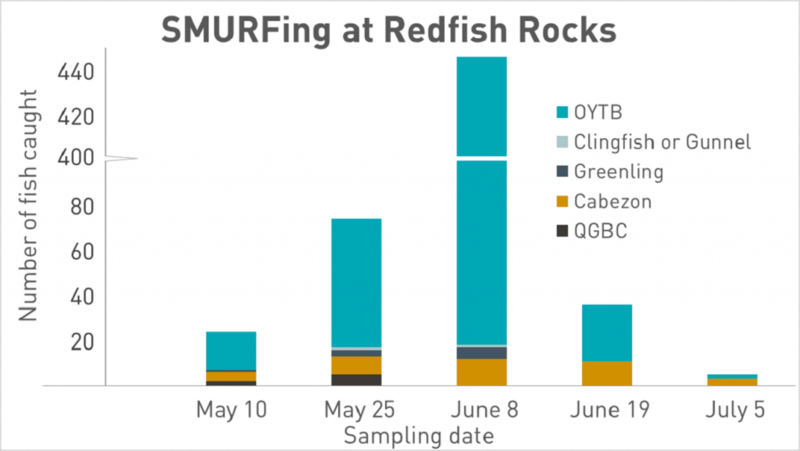 This season we have SMURFs in place at two marine reserve sites: Otter Rock and Redfish Rocks. Juvenile fish are currently being collected from our SMURFs at each reserve every two weeks. 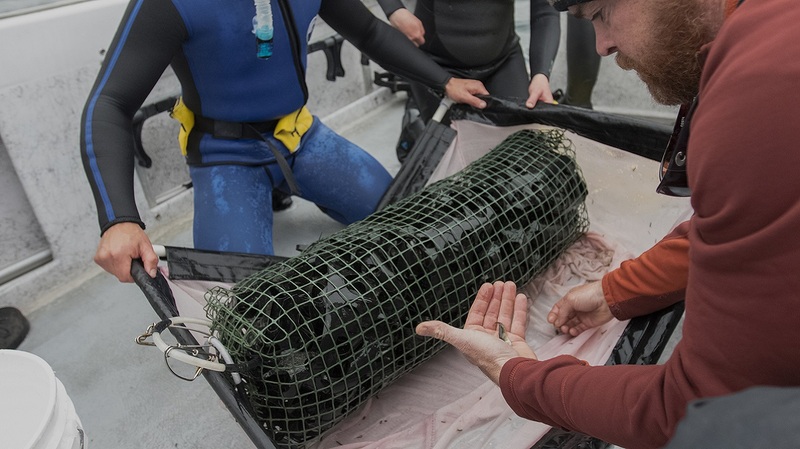 This is a collaboration between researchers at Oregon State University (OSU) and ODFW, along with help from the Oregon Coast Aquarium and the fishing vessel Mach-1 out of Port Orford. It’s been a successful start to the season, despite a small setback in the form of a giant storm in late April, during which two of our SMURF moorings were lost. Juvenile fish can spend days to months in the plankton before settling to shallower, nearshore waters. This process is called recruitment. This is the 10th week of SMURFing this season. On Wednesday, we collected SMURF samples from the Redfish Rocks Marine Reserve. Samples were somewhat slim, with just 3 Cabezon and 2 OYTBs (Olive-Yellowtail-or-Black-Rockfish) collected from the SMURFs. However, these numbers aren’t surprising for this time of year as there tends to be a recruitment lull in July as different species begin and end their recruitment pulses. The number of juvenile fish caught in the SMURFs changes throughout the season. There are sometimes “pulses” where hundreds of fish are collected — check out the pulse on June 8th — or weeks like this one, where we only saw five fish in our SMURFs. Understanding when pulses happen and what is driving them is one of the main focuses of this project. In the above figure, OYTB stands for “Olive, Yellowtail, or Black Rockfish” and QGBC stands for “Quillback, Gopher, Black-and-Yellow, Copper, or China Rockfish”. Since it is often difficult to identify these small fish to species, fish counts are grouped like this in preliminary data – until more detailed genetic work can be conducted to identify them to species. Check back here, at the Oregon Marine Reserves website, for weekly updates about what we’re seeing in our SMURF samples at each site as well as bonus information about what makes SMURfing so interesting and important. For a more in-depth primer on the SMURF project, check out our leaflet.